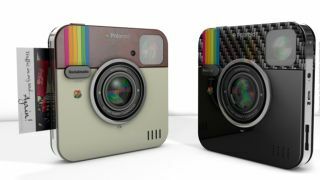 Polaroid has agreed a deal to throw its name behind the intriguing Socialmatic concept, which takes the spirit of Instagram and turns it into a physical instant camera. The imaging giant, whose self-developing Land cameras inspired the modern desire for retro-looking snaps, has latched onto the concept design from ADR Studios and will help to make it a reality by Q1 2014. No technical details have been publicised for the Polaroid Socialmatic Camera (which will be built by accessory-maker C&A Marketing), but the designer outlined a clear vision and it'll be interesting to see if Polaroid sticks to the script. The concept device has a 4.3-inch touchscreen, runs on Android, offers interchangeable lenses and a built-in LED flash, as well as 16GB of storage and Wi-Fi and Bluetooth connectivity for uploading snaps. The Polaroid Socialmatic Camera is also likely to retain the designer's desire for a built-in printer, truly combining the physical and digital worlds in a way rarely seen in the modern era. The brains behind the concept also outlined a desire for supporting different printer inks, while they also wanted QR codes printed on every snap. It would also be interesting to see apps like Instagram featured on the device to enable users to apply their filters and then print out the picture within a few seconds. We're excited to see this concept become a reality. Where will Polaroid go with it? Will it maintain the original concept designs and features? Could this true Oroborus-like piece of tech truly catch on? "We are so proud to work together with C & A and Polaroid, giants of digital photography," said Antonio De Rosa, CEO of Socialmatic on the company blog. "It 's been a long and difficult negotiation but we were strongly motivated to reach an agreement to create a small revolution in digital photography. "This mix of Hardware and Software, together with our brand new photo social network will fill the gap between virtuality and reality." Socialmatic promises the release of more information in the near future with the on-sale date pencilled in for early 2014.